Beautiful, sensitive post processing. Really works! Fantastic photo…love this one. You can feel the childs perpective from this shot. I just got back from the Caribbean and rode the local buses on many of the islands. My husband and I were the only westerners on the buses and we met some wonderful people. The story behind "Boy waitin on a bus in Mendoza, Argentina"
In South America the buses provide an important way to travel between cities and countries. In different classes, it is really affordable for westerners and for locals apparently as well as most are all filled to the max. Some have semi-camas or even camas, Spanish for bed. This means 180 degrees chairs which serve as beds and this way you will dream all the way to your next destination, sometimes thousand kilometers away. Every decently sized city has a large busstation like this one at Mendoza, capital of the Mendoza province in western Argentina. 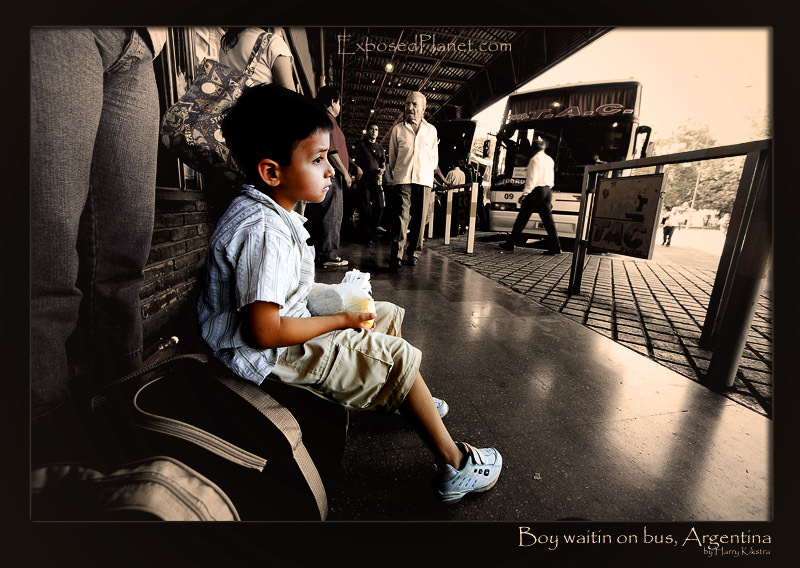 This little boy was dreaming away, while waiting on his bus and clutching his little bag of food and candy as it was probably his only possession..